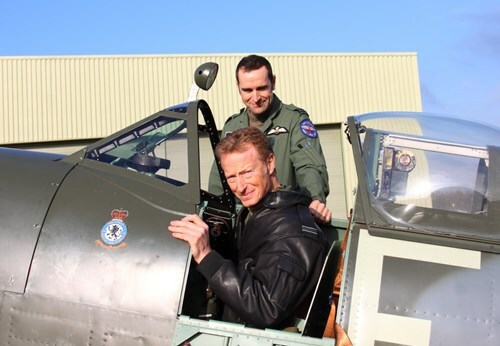 Well known and experienced BBMF pilots Sqn Ldr Dunc Mason and Flt Lt Antony Parkinson flew Aero Legends Spitfire HFIX TD314 for the first time on 18th November 2014 from Duxford. Both pilots are full time fighter pilots for the Battle of Britain Memorial flight at R.A.F. Coningsby but in their spare time will fly TD314 for Aero Legends. Once completed, both pilots will also fly our T9 NH341 which is currently being rebuilt. To follow her progress towards airworthiness follow this link. Both Dunc and Parky were very complimentary about TD’s handling and said she was fast smooth and agile, a very nice example of a Spitfire.